You can learn a lot about a person by looking at their desk. Beyond the basic indicators that tell you whether someone is tidy or messy, the way we create and decorate our personal workspaces says something about how we cultivate energy and stay balanced from nine to five. Whether you WFH or are an in-office regular, a pristine desk is the key to a healthy flow. For the type A employee, that dream workstation might encompass a top-notch storage system with a place for every pen, rubber band, and miscellaneous Sticky Note. For others, an eclectic mood board and trailing plant are the only two essentials that make firing off emails on Monday morning feel like less of a chore. Want to kick off 2019 feeling like a total boss? Ahead, we break down 10 of our favorite desk decor ides for every work personality. 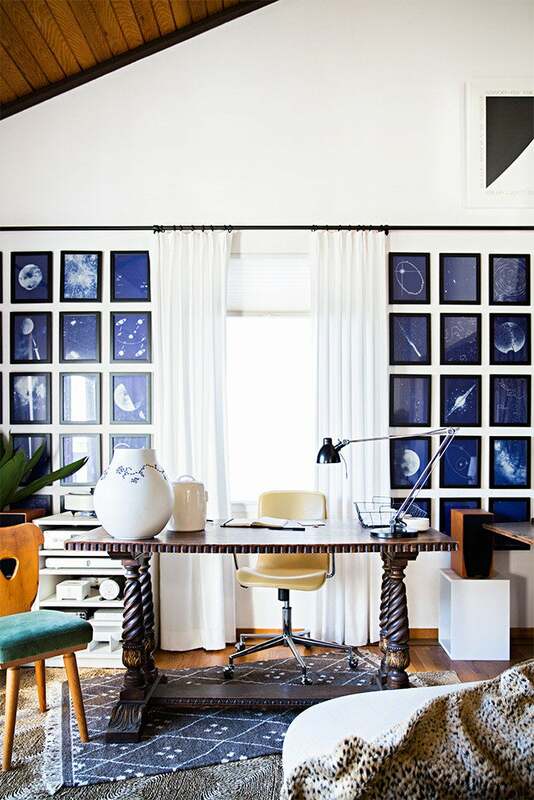 If there was ever a place for an ever-changing, ever-inspiring gallery wall, it’d be the home office. More is more is the secret to interior decorator Malin Persson’s Swedish home, where a series of prints, magazine pages, and photographs line her built-in desk for a moody, editorial look. In designer Rachel Craven’s minimalist home office, a feathery bunch of pampas grass sets a calming tone for her personal workspace. If you need peace and quiet to work, ward off noise and unwarranted interruptions with wispy florals, warm woods, and organic ceramics. Depending on her mood, clothing designer Jesse Kamm can choose to sit or stand at this custom setup for two. With a bulletin board large enough to observe her ideas from afar and a built-in desk lamp for added flexibility, she can still get work done while strolling around or stretching her legs. Minted founder Mariam Naficy’s tiny yet mighty workstation is the perfect place for jotting down notes. With little surface space available, a bare bones approach provides room for the essentials. Framed prints and a fluffy sheepskin throw make finishing the task at hand a touch more enjoyable. If you have the ability to bring a slice of home with you to the office, pick an accent piece you’d want in your living room and bring it to your desk. While it doesn’t have to be as large as the two vases that sit atop Lynn Leonidas’s large antique table, having a homey reminder around will help the day fly by faster. Known to be mood boosters and air purifiers, dressing up your work space with leafy greens won’t just bring much-needed color to your space, but it will help you breathe easier and feel more energized. Christmas cactus, aloe, and peperomia are a few of our favorite hard-to-kill greens for the office. We love the matching look of Yasmine Boheas’s terra-cotta pot and coordinating lamp. You know that awkward wall ledge you don’t know what to do with? Use it as a bonus spot for tools and desk accessories. A layered setup like this is perfect for an artist who needs help keeping tools in order and out of the way. The typical excuse for a college work space usually consists of a cinder block wall and a gaudy wood desk that may or may not snap at any moment. Spice up your dorm room with a chic pegboard or bulletin board, metallic desk accessories, a photo or two from back home, and a motivational hashtag. Clutter is a desk’s worst nightmare. If you’re the type of person who crumbles under a messy desk, stick exclusively to the essentials. Without feeling too stale, Eliza Wexelman’s perfectly composed home office strikes the balance between barely there and happy to be here. Two’s company for prop stylist Alyssa Hoppe, whose plant-filled home doubles as her studio. If you and a colleague share a back-to-back desk arrangement, pick a plant friend and larger accents—like a catch-all basket or collection of candles—to split. Keeping your own keepsakes to a minimum and focusing on shared functional objects will help keep your space tidy.